Public and government agencies in the United States are calling for increased accountability in all aspects of K-12 education and teacher preparation, demanding standards of performance and allocating funding to assist students and teachers to meet these standards. With the current influx of federally funded grants such as the Preparing Tomorrow's Teachers To Use Technology , many in instructional technology (IT) departments who serve teacher education programs wrestle once again with working outside the initial teacher certification areas. In light of new standards, not only in technology but also in all content areas, how can IT departments work with teacher education faculty and programs to ensure that novice teachers will be able to meet these standards? We propose that developing purposeful relationships of a cooperative nature between these two programs is a critical step toward preparing preservice educators to integrate technology. Shoffner, M.B., Dias, L.B. & Thomas, C.D. (2001). A Model for Collaborative Relationships Between Instructional Technology and Teacher Education Programs. 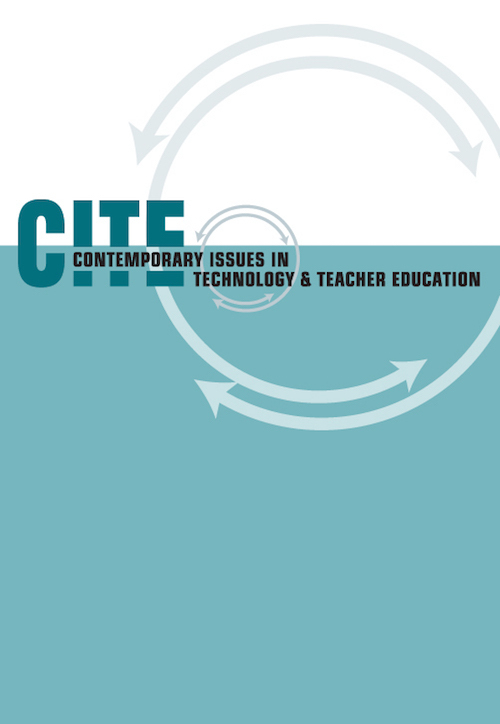 Contemporary Issues in Technology and Teacher Education, 1 (3), 395-411. Norfolk, VA: Society for Information Technology & Teacher Education. Retrieved April 25, 2019 from https://www.learntechlib.org/primary/p/10734/. Bennett, C., & Daniel, L. (1999). Preparing novice teachers to use technology: Do they practice what we teach? Paper presented at the Society for Information Technology and Teacher Education Conference, San Antonio, TX. Cognition and Technology Group at Vanderbilt. (1991). Technology and the design of generative learning environments. Educational Technology, 31(5), 34-40. Cook, L.J. (2000). The effects of web-based instruction on preservice teachers' attitude, confidence, and perceived value regarding internet-based learning resources. Unpublished doctoral dissertation, Georgia State University, Atlanta. Dias, L.B., Shoffner, M.B., & Atkinson, F.D. (2001). A study of first year middle school teachers' ability to integrate technology. Unpublished manuscript. Duffield, J.A. (1997). Trials, tribulations, and minor successes: Integrating technology into a preservice teacher preparation program. TechTrends, 42(4), 22-26. Guglielmino, L.M. (1977). Development of the self-directed learning readiness scale. (Doctoral dissertation, University of Georgia) 1977. Dissertation Abstracts International, 38, 6467A. Hannafin, M.J. (1999, February). Learning in open-ended environments: Tools and technologies for the next millennium. Paper presented at the 1999 annual meeting of the Association for Educational Communications and Technology, Houston, TX. Hannafin, M.J., Hall, C., Land, S., & Hill, J. (1994). Learning in open-ended environments: Assumptions, methods, and implications. Educational Technology, 34(10), 48-55. Hill, J.R. (1999). Teaching technology: Implementing a problem-centered, activity-based approach. Journal of Research on Computing in Education, 31(3), 261-279. Kovalchick, A. (1997). Technology portfolios as an instructional strategy: Designing a reflexive approach to preservice technology training. TechTrends, 42(4), 31-36. Leggett, W., & Persichitte, K.A. (1998). Blood, sweat, and TEARS: 50 years of technology implementation obstacles. TechTrends, 43(3), 33-36. Leh, A. (1999). Research on the characteristics of 'The Technology Course.' Paper presented at the Society for Information Technology and Teacher Education Conference, San Antonio, TX. National Council for Accreditation of Teacher Education. (1997). Technology and the new professional teacher: Preparing the 21st Century classroom. Washington, DC: Author. National Council for Accreditation of Teacher Education. (2000). NCATE 2000 unit standards. Washington, DC: Author. Shoffner, M.B. (1996, February). Teachers and technology: What makes a technology adopter? Paper presented at the 1996 Annual Meeting of the Association for Educational Communications and Technology, Indianapolis, IN. Shoffner, M.B. (1999, February). Development of an online preservice education technology course. Paper presented at the 1999 Annual Meeting of the Association for Educational Communications and Technology, Houston, TX. Strudler, N., & Wetzel, K. (1999). Lessons from exemplary colleges of education: Factors affecting technology integration in preservice programs. Educational Technology Research and Development, 47(4), 63-81. U.S. Congress, Office of Technology Assessment. (1995). Teachers and technology: Making the connection (OTA-HER-616). Washington, DC: U.S. Government Printing Office. Vogt, W.P. (1999). Dictionary of statistics and methodology: A non-technical guide for the social sciences, (2nd ed.). Thousand Oaks, CA: Sage Publishing. Vygotsky, L. (1978). Mind in society. Cambridge, MA: Harvard University. Change in Technology Integration Model: Does the Current Model Work for Preservice Teachers?